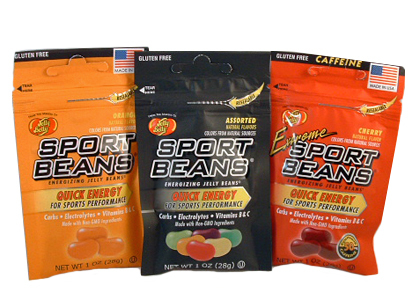 Sport Beans - 1 oz. Ideal for an athlete or anyone needing a pick-me-up, the unique blend of vitamins, carbohydrates, and electrolytes in these Sports Jelly Beans is sure to give an energy boost. Choose Orange, Assorted, or Extreme Cherry flavor. The Cherry flavor has caffeine in them.